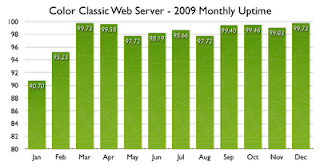 2009 started off a bit rocky for uptime, as a combination of a flaky router and spring thunderstorms in central Texas combined to take the server offline when it lost its internet connection or electrical power. Replacing the router and adding a UPS improved uptime significantly as you can see from the bar graph below. The final tally for 2009 as recorded by websitepulse.com (who kindly monitors this site for free!) is an uptime of just under 98%. While that's a remarkable statistic for a computer that's 16 years old operating on residential broadband internet connection, there's still room for for improvement. Here's hoping 2010 will bring uptime over the 99% average! Hey, just sent you an e-mail. Great work with this server! And great entry about the prototype clear CC.